Firstly, investors are advised to monitor the API stockpiles report which is due to be released at 20:30 (GMT). If you recall, the API dented the Oil market by showing a sudden a build of 5.321 million inventories. Can we expect the same today? Considering the news of increased Russian production and speculation that Saudi Arabia will cut the oil price, most companies may wait for a drop in prices before stocking Crude Oil. Consequently, the API may see a build in inventories this week. Secondly, Crude Oil is trading massively oversold after falling 2% yesterday. 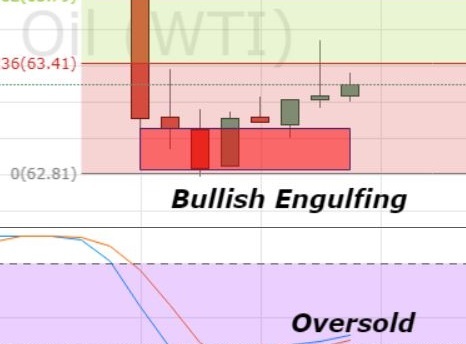 Therefore, it has closed a bullish engulfing candle which is signaling the potential for a retracement. Oil can face an immediate resistance near $63.42 (23.6% Fibo) and $63.79 (38.2% Fibo). A break above $63.79 is likely to lead price towards $64.40. Whereas, on the lower side, $62.80 and $61.75 are strong support levels. Looking at the 60-min chart, Crude Oil is facing a solid support near $65.40. The number of Doji and Spinning Top candles are signifying the neutral sentiment of investors. It’s mostly because of the API report which is due to be released during the US session today. Investors are suggested to keep an eye on $62.85 to take a buy entry. Whereas, on the upper side, $64.40 looks like a good selling level. All the best!